If you have osteoporosis or have received cancer treatment, your bone-strengthening medication may put you at risk for a serious dental complication, especially if you needtooth extractions, implants, or other types of dental surgery as part of your orthodontic treatment. According to the American Dental Association (ADA), a condition called Osteonecrosis of the Jaw (ONJ) has been associated with t he intravenous use of bisphosphonate drugs such as Zometa (zolendronic acid), Aredia(pamidronate), Ostac and Bonefos(clodronate). But people taking the drug in oral form as Fosamax (alendronate),Actonel (risedronate), and Boniva(ibandronate sodium), might also be at risk. In addition, Didronel (etidronate disodium) and Skelid (tiludronate disodium), bisphosphonate drugs used to treat Paget's Disease, have been implicated in causing ONJ. ONJ is a serious condition in which small areas of bone in the upper or lower jaw become infected or inflamed and die, producing a searing neuralgia-like pain. The condition is irreversible -- there is no cure. Reports about the link between bisphosphonate drugs and "jaw bone death" began to surface in late 2003, when Dr. Robert E. Marx, a maxillofacial surgeon in Florida, wrote a letter to the editor of the Journal of Oral and Maxillofacial Surgery. He realized that he was inexplicably seeing more and more patients with osteonecrosis. After some investigation, Dr. Marx learned that all the patients had been taking Aredia or Zometa. Eighteen of 36 patients (50%) had multiple myeloma (cancer of the plasma cell). Dr. Marx and others observed that with more than minor dental surgery there was a risk of very poor healing of the jaw. Over time, additional cases have been reported around the world. Salvatore Ruggiero, Chief of Oral and Maxillofacial Surgery at Long Island Jewish Medical Center in New York had also seen an increase in ONJ among his patients. Most were cancer patients who had received the intravenous bisphosphonates Zometa or Aredia or both for excessive calcium in their blood or bone tumors. But about 10% were osteoporosis patients who had taken an oral bisphosphonate, mainly Fosamax. In May 2004, Ruggiero co-wrote a report on 63 patients with ONJ, which was published in theJournal of Oral and Maxillofacial Surgery. Six had taken Fosamax, and a seventh had taken Actonel. Further study was done and published in the Journal of Clinical Oncologyin 2005 and February 2006. The most recent article concluded that "ONJ appears to be time-dependent with higher risk after long-term use of bisphosphonates in older multiple myeloma patients [ages late 50s to early 60s] often after dental extractions. No satisfactory therapy is currently available. Trials addressing the benefits/risks of continuing bisphosphonate therapy are needed." 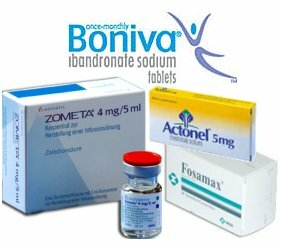 Most of the cases of ONJ that have been reported are linked to the intravenous drugs Aredia and Zometa, which are often given to treat such cancers of the breast and prostate, as well as multiple myloma. But there may also be risk for people taking oral doses of bone-strengthening drugs such as Fosamax, Actonel, and Boniva. Some studies have shown that there is very low risk for people taking an oral bisphosphonates. However, lawsuits have been initiated around the country by patients who took Fosamax or Actonel and then developed ONJ or ONJ-like symptoms. Merck, the manufacturer of Fosamax, has said it did not receive any reports of the disease in the more than 17,000 patients who participated in its clinical trials. According to a letter in the Journal of Oncology Practice (January 2006), "ONJ is not seen commonly—incidence is estimated at approximately 1% to 10% in patients receiving intravenous bisphosphonates." And apparently there is little evidence that taking oral bisphosphonates such as Fosamax can cause ONJ. However, the evidence was strong enough to force Merck to change its labeling on Fosamax. In January 2005, Merck received a request from the Food and Drug Administration (FDA) to update the label for Fosamax to include bisphosphonate class labeling for ONJ. The new label went into effect in July 2005. Now, all bisphosphonate drugs include a similar warning in their literature. According to the FDA: "If patients on bisphosphonates do require dental procedures, there are no data available on whether stopping the drugs reduces the risk of osteonecrosis of the jaw. The clinical judgment of the physician should guide each patient's management, based on an assessment of benefits and risks." In a paper published last year in the Journal of the American Dental Association (JADA), a team of dentists and dental researchers speculated that bisphosphonates may inhibit bone growth and decrease the blood flow within oral bone tissue. Bisphosphonates can persist in bone for months and sometimes years after the drug has been discontinued. Presently, no one seems to understand precisely why these drugs cause ONJ. It has been speculated that the risk seems to increase with the length of time a person is on these drugs, and the amount of drug taken. ONJ can be treated with antibiotic therapy, prescription periodontal mouth rinses, and removable mouth appliances (such as mouthguards). Surgery can make the condition worse, although sometimes it is necessary to remove dead tissue. However, at present there is no cure for the condition. The American Association of Endodontists (AAE) recently issued an official statement on the subject, warning of the risks. AAE President Marc Balson, D.D.S. said, "With this position statement, we hope to ensure the highest quality care and safety for patients taking bisphosphonates.” He went on to say,“Until further information becomes available, the AAE recommends that all patients taking bisphosphonates be considered at some risk for ONJ, recognizing that the magnitude of the risk varies by patient. The AAE also encourages patients taking bisphosphonates to inform their dental care providers and consult with specialists as needed,” he said. Thanks to the AAE's public education efforts, articles warning the public of the risks associated with bisphosphonates have been published in the Wall Street Journal, the New York Times, the Los Angeles Times, by United Press International, WebMD.com, theChicago Tribune, the Las Vegas Journal Review, and USA Today, among other publications. A Risk For Orthodontic Treatment? What does this mean for the adult orthodontic patient? Simply this: if you have taken or are currently taking a bisphosphonate drug, you should tell your orthodontist and your dentist. This is especially important if you plan to have any type of jaw surgery, implants, or tooth extraction. So far, no conclusive data have surfaced linking ONJ to "normal" non-surgical orthodontic and dental treatment (where no tooth extractions or jaw surgery is required). One short research project was done jointly by the Medical College of Georgia and the University of Alberta, Canada. Published in March 2005 by the journal of the International Association for Dental Research, the study concluded "...that orthodontic treatment may be contra-indicated when taking [Fosamax or Evista]..." If any new information becomes available, we will publish it on this website. If your dentist is not familiar with the condition, tell him to go to the website for the American Dental Association or the International Myeloma Foundation, where he can find more information. Or, you can print this article and show it to him. Special thanks also to ArchWired.com reader Pat K.